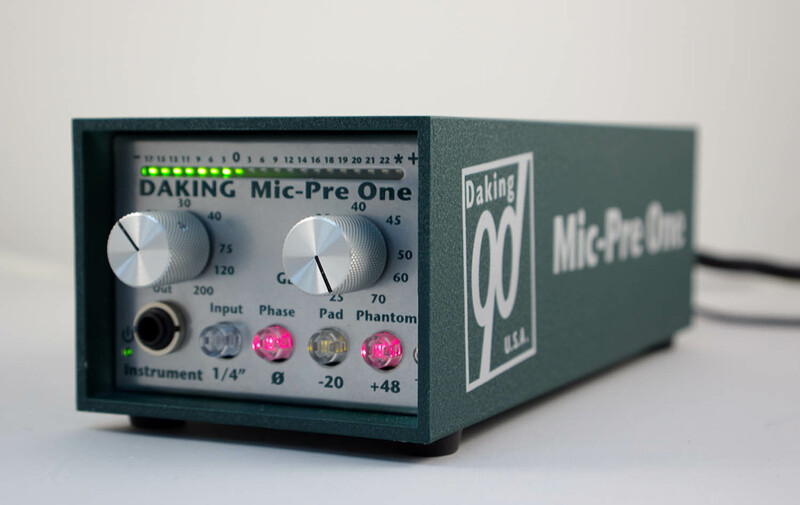 The Mic-Pre One is a single channel mic preamp that we originally designed with the home recordist who only needs one input in mind. Because of it’s high performance and robust mechanical design, it has also become first choice of many professionals when doing small remotes. They just throw two or three in a suitcase and off they go! 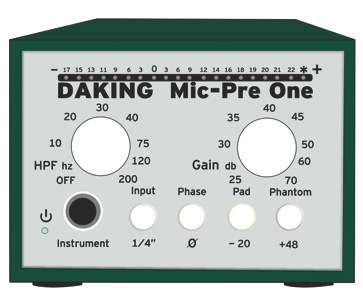 The Mic-Pre One’s great performance comes from our existing popular Daking designs, the Mic Pre EQ, Mic Pre IV, and console modules. All of these preamps use the same unique preamp circuit which features a Jensen input transformer and a Class “A” discrete transistor preamp with a single sided power supply. The Mic-Pre One has a freestanding ‘DI-style’ aluminum enclosure, ensuring both strength and noise immunity. 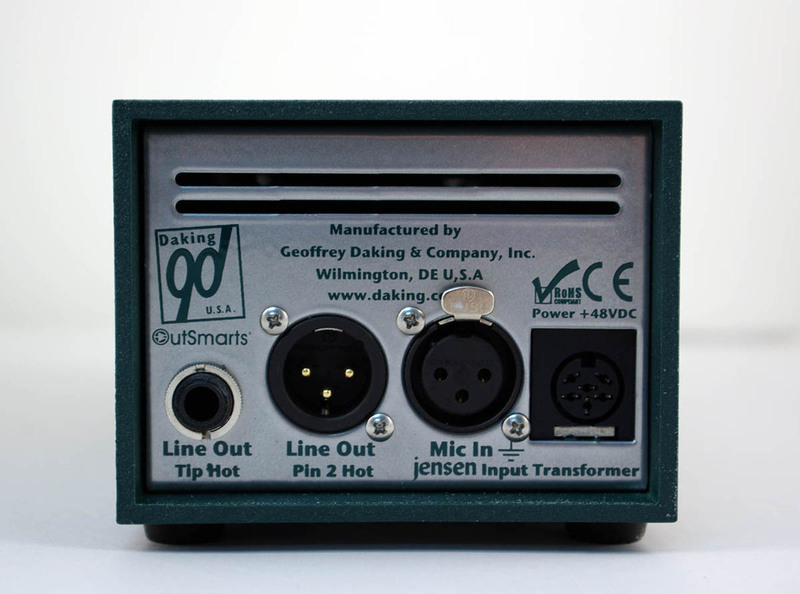 • Direct 1/4″ instrument input on the front panel. 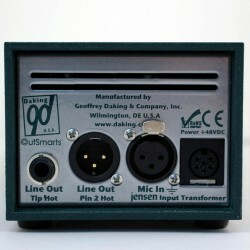 • Balanced 1/4″ TRS output which can be used with unbalanced devices with no deterioration of signal. Big studios have big monitors, good isolation and quiet air conditioning. Also, if you are recording to tape at 30ips, you cannot record below 40Hz. Small studios usually have small monitors that don’t reproduce very low frequencies well, have little or no isolation and poor ventilation. Modern digital recorders will easily record 10Hz. Because of this, many home recordings are filled with low frequency rubbish that clouds, clutters and takes up space in the mix. 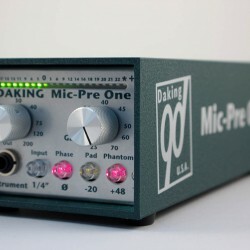 The High Pass Filter in the Mic-Pre One is a powerful tool. The Filter allows the recordist to eliminate unwanted low frequency trash before it enters the signal chain without affecting the program material. This can be a giant step toward making the home record more professional.